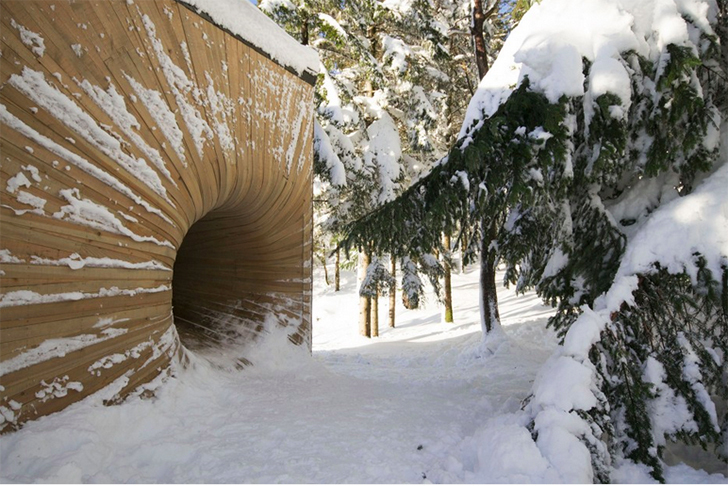 This mountain cabin has a strange wooden tunnel door that looks as though it might lead into another dimension. 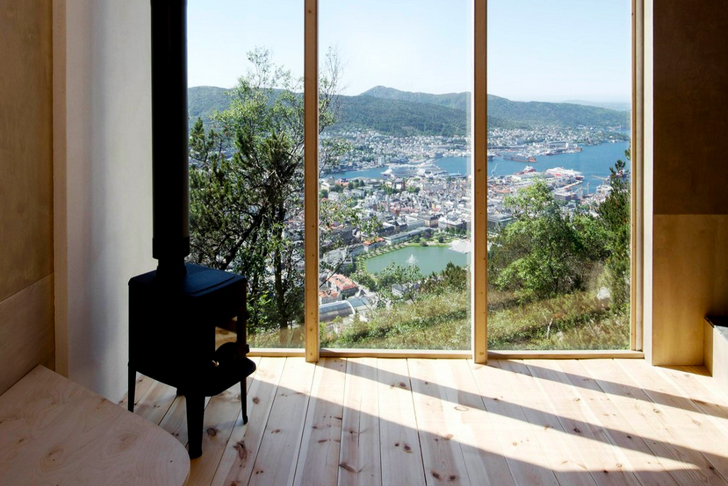 Located on a steep mountain in Bergen, this room with a view was crafted by a design-build workshop at the School of Architecture, lead by Espen Folgerø from OPA Form architects. 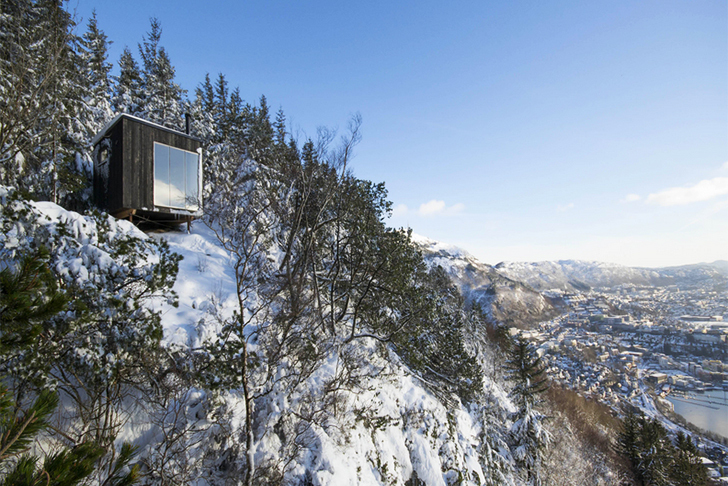 Called Tubakuba (Tuba Cube), it uses different types of Norwegian wood and prides itself of being the only off-grid hotel room in Bergen. This mountain cabin has a strange wooden tunnel door that looks as though it might lead into another dimension. The 150 sq ft tuba cube was crafted as a practical, hands-on University project, to gain building skills and solve problems onsite. Thanks to G.C. 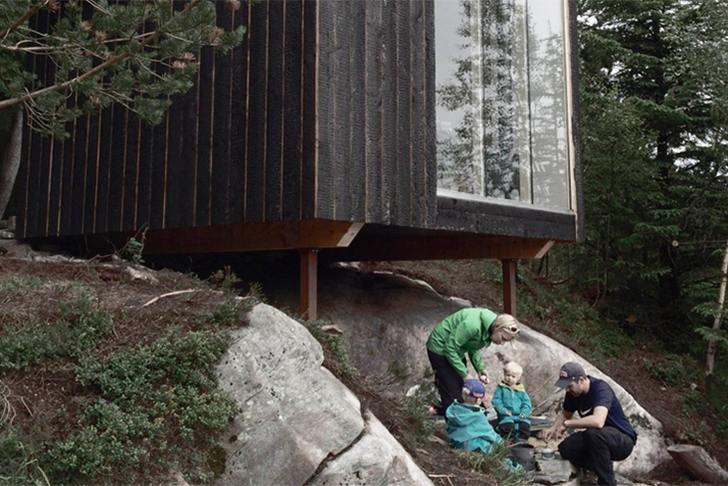 Rieber Funds’ financial support, the students constructed this mountain retreat from 95% wood. 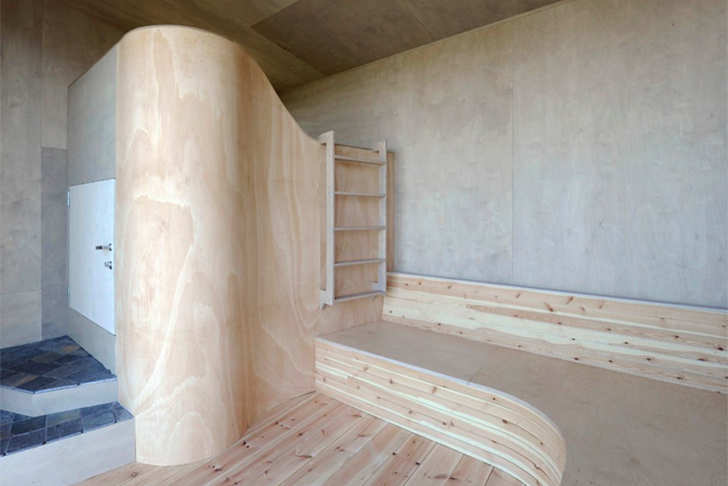 While its small, cozy interior was clad in plywood and insulated with breathable wooden fibers, its four facades are all completely different. One side was made from burned larch using a traditional, maintenance-free Japanese technique known as Shou Sugi Ban, which prevents fungi and decay. The south wall is clad with untreated larch, which will turn gray and blend in with the forest with time. The 150 sq ft tuba cube was crafted as a practical, hands-on University project, to gain building skills and solve problems onsite. Thanks to G.C. Rieber Funds‘ financial support, the students constructed this mountain retreat from 95 percent wood. While its small, cozy interior was clad in plywood and insulated with breathable wooden fibers, its four facades are all completely different. One side was made from burned larch using a traditional, maintenance-free Japanese technique known as Shou Sugi Ban, which prevents fungi and decay. The south wall is clad with untreated larch, which will turn gray and blend in with the forest with time. 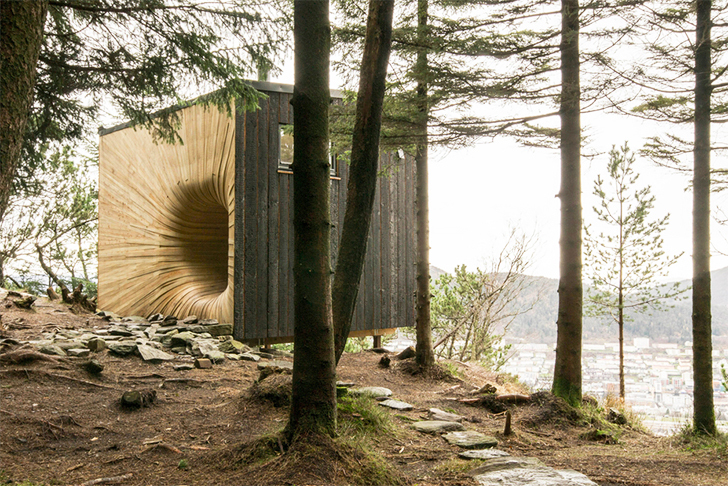 But the most distinctive part is the fantastic entrance tunnel made from pine shavings, which welcomes adults and kids alike into Bergen’s first and only off-grid hotel room.